This magnetic pinning system is perfect for fastening your duvet covers, keep your duvet in place. Easy to use and remove. No more bunching sheets! Prevent comforters and duvets from bunching & shifting. Easy to use, just put the pin through duvet and insert into the cap. 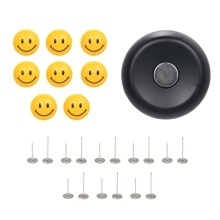 Easy to remove, just use the included magnetic detacher to separate the caps and pins in seconds. Comes with both short pins and long pins, suitable for various duvets(both thin and thick duvets). Multiple usages, it also can be used to secure furniture slipcovers, hang decorations, hold curtains and much more.